This description does not do justice as you can click on groups of organisms and get more details. The database is very strong on the description of habitats. I have not really had a chance to explore this datatbase yet. It is not comprehensive (e.g. Chondrus crispus not included) , but it has got to be worth the dosh just for the photographs and information on sea anemones and other anthozoans. To the non-marine enthusiasts, the Anthozoa are a subphylum of the Cnidaria (stinging animals like jellyfish). The Anthozoa contain the attractive sea anemones, corals, sea fans, sea-pens etc. Up until now there has not been a readily available colour photographic guide to these most attractive animals in British seas. The standard literature was British Anthozoa by R L Manuel (Academic Press: Synopsis of British Fauna series) ISBN 0.12.470050.0 This is the 1981 edition. A later edition was produced. It contains the accurate line drawings. There was a preceding MCS Mini-Print series on sea anemones. Not quite true - there was a very useful mini-print set that R Manuel produced for MCS in 1980, although I fear that the master set was destroyed in the fire that also finished off the sponge guide. It has photos of most, and descriptions of 69 species. The Biomar CD-ROM rectifies this shortfall, and the section on the sea anemones is reason enough for acquiring this CD-ROM. Almost all the sea anemones found around the British Isles are illustrated by superb photographs and a brief explanation about the anemones and other anthozoans. These include rare and uncommon species that I have never seen in the wild or even in photographs before. There is a comprehensive database with photographs of the British Opisthobranch Molluscs (sea slugs) included as well. Essential for any marine enthusiast. 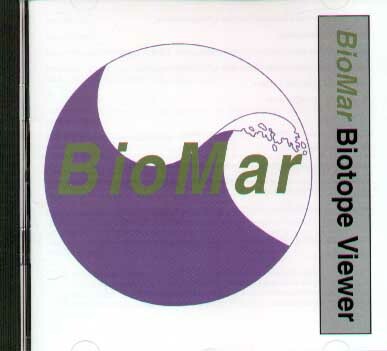 Enclosed is a complimentary copy of the BioMar-Viewer compact disc for review by your journal. If you get it reviewed please send a copy of the review to Dr Mark J. Costello, EcoServe, 17 Rathfarnham Road, Terenure, Dublin 6W, Ireland. a bibliography of marine envimment literature for Ireland. The baseline information is of importance to environmental managers, consultants and researchers. The biotope and species photographs and descriptions that illustrate this data provide a state-of-the-art educational tool for studying marine species and biotopes. 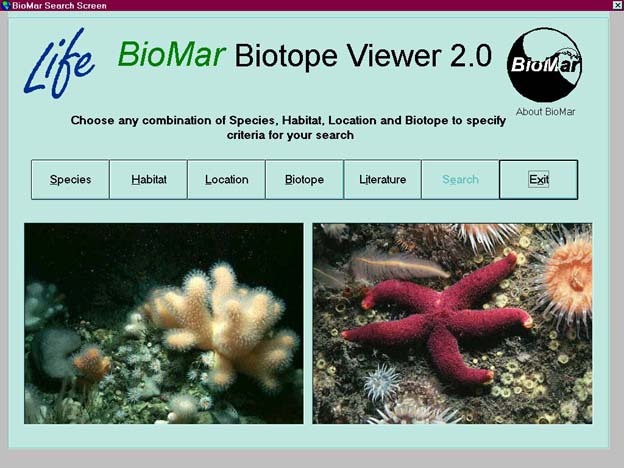 This viewer demonstrates how information on marine life and biotopes may be disseminated as computer software. Information in this publication may be searched based on geographical location, habitat and/or species, if you use the special installation routine (details on enclosed). The data files may also be accessed directly if you have the necessary software. This viewer was produced as part of BioMar, a project part flinded by the European Commission under the LIFE - Environment programme.